Armin Strom is a very interesting independent brand. Their movements are designed and produced in-house using modern engineering but keeping the rigour and art of the traditional watchmaking. The latest timepiece, the Armin Strom Mirrored Force Resonance comes with a magnificent hand guilloché dial made by Kari Voutilainen. The Mirrored Resonance is a tour de force in modern watchmaking and it was reviewed in detail here. The bold design and interesting movement send a strong message. Plus via their Configurator personalisations are available from the preorder stage and make the Armin Strom watches even more desirable for those wanting something unique but still recognisable. 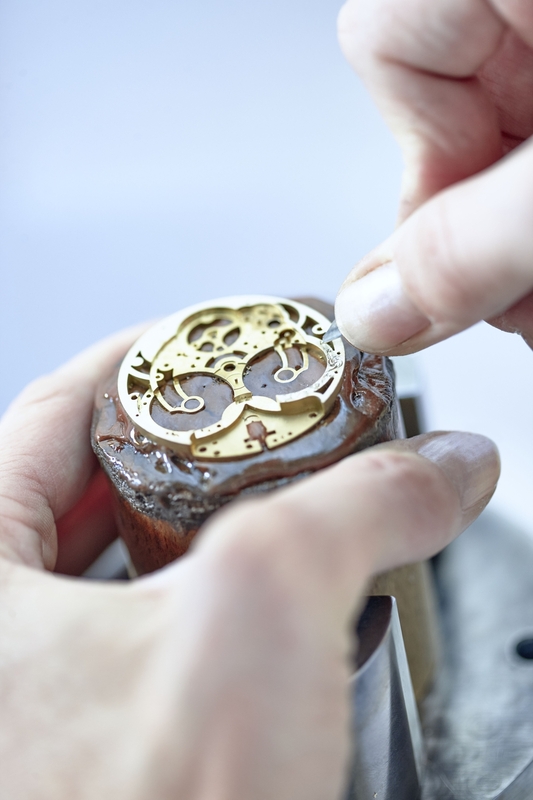 Mr Armin Strom started, in the 80s, with skeletonisation and engraving of movements. At the beginning of the 90s, Armin Strom enters the Guinness Book of Records with smallest hand skeletonised watch. The company was taken over by Serge Michel in 2006, a close family friend of Mr Strom. A year later, Claude Greisler formerly with Christophe Claret, joins as director. The brand then started to make the necessary steps to become truly independent. In 2009, Armin Strom inaugurates the new manufacture with the first in-house movement ARM09. The brand works with raw material as brass and steel, being able to produce up to 98% of the movement. 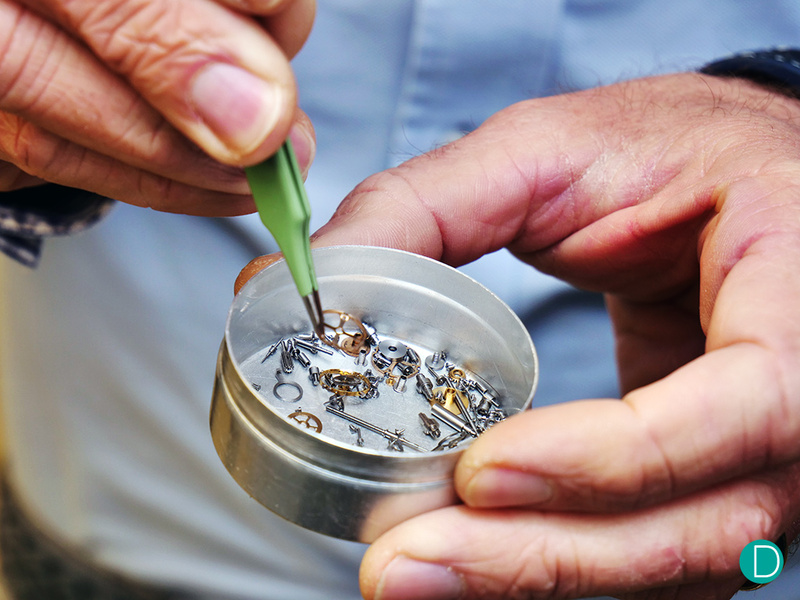 The Armin Strom watches still relies on other suppliers for hairsprings, mainsprings and jewels. The cases are produced by another small independent manufacturer, though they are able to manufacture these in the facility. Since 2009, Armin Strom has presented a new movement almost every year. 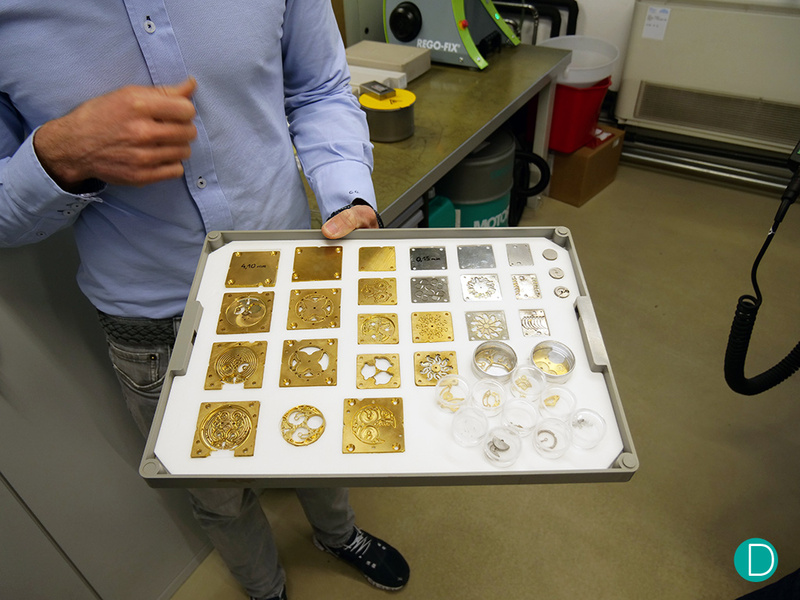 We took a tour of the facility and were fascinated by how complete a manufacture that Armin Strom is. It all starts in a small room, covered by drawings and other signs of creation and development. Here Claude outlines all his thoughts on computer with the aid of a 3D drafting and design software. Parts are designed, and construction drawings made. At this initial stage, everything is digital, and although software these days can perform simulation, it is sometimes necessary to create prototypes to ensure that everything works properly. All design work is currently carried out in this room. From the design of the movements, to the cases and dial, hands and other accessories. 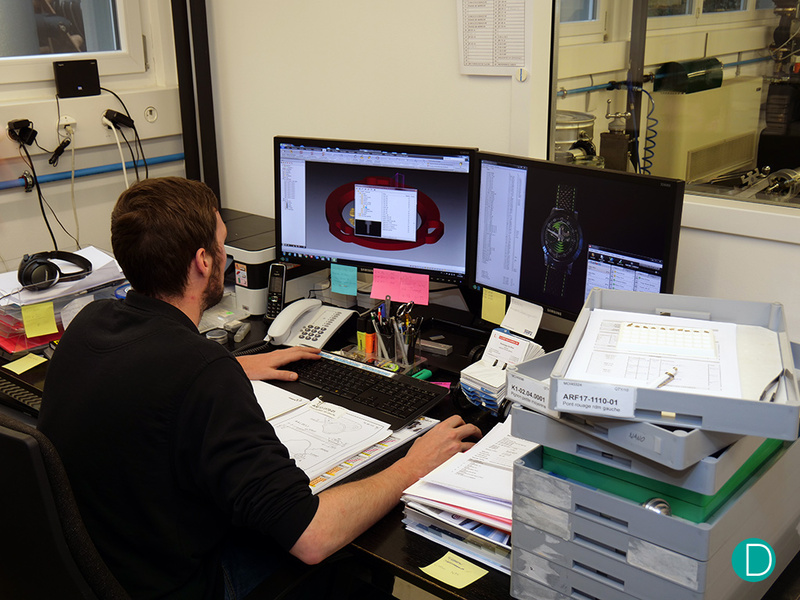 Currently Claude works with another designer to do these tasks, but we understand that some future watches will be designed with the aid of professional design houses. 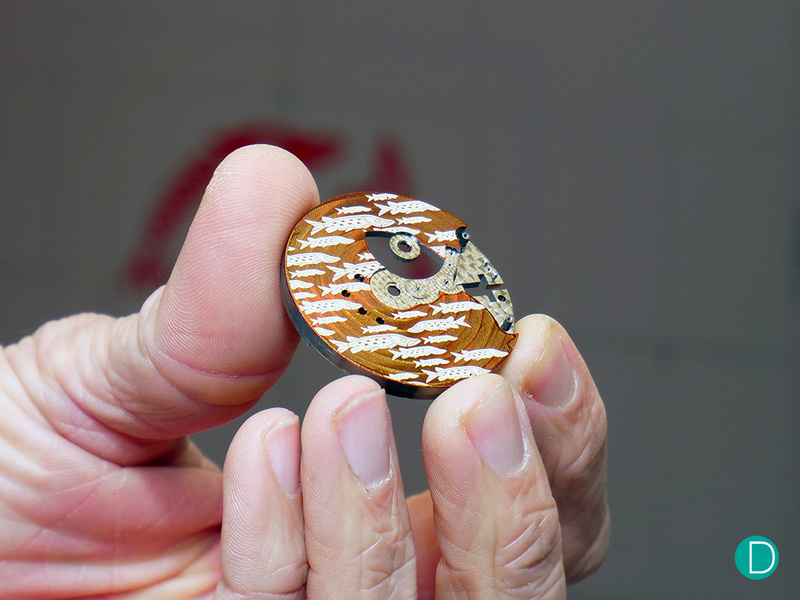 With the help of computer-aided designs and by building prototypes, the watches can be “tested” before actual building. 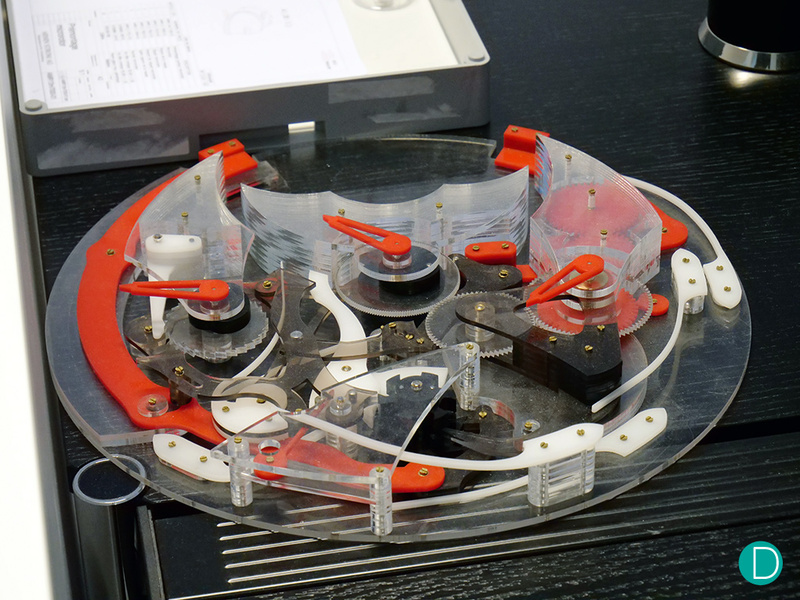 Armin Strom often employ perspex models to ensure that the CAD design works. We understand this a system initially pioneered by Renaud and Papi in the early years, and have become the standard bearer for a large scale proof of a design. Armin Strom practices this too. A scale model is used for a better understanding of the design. The aesthetics can be studied to obtain the best balance of form and function. Claude Greisler explains the importance of modelling during the design stage to proof it works. 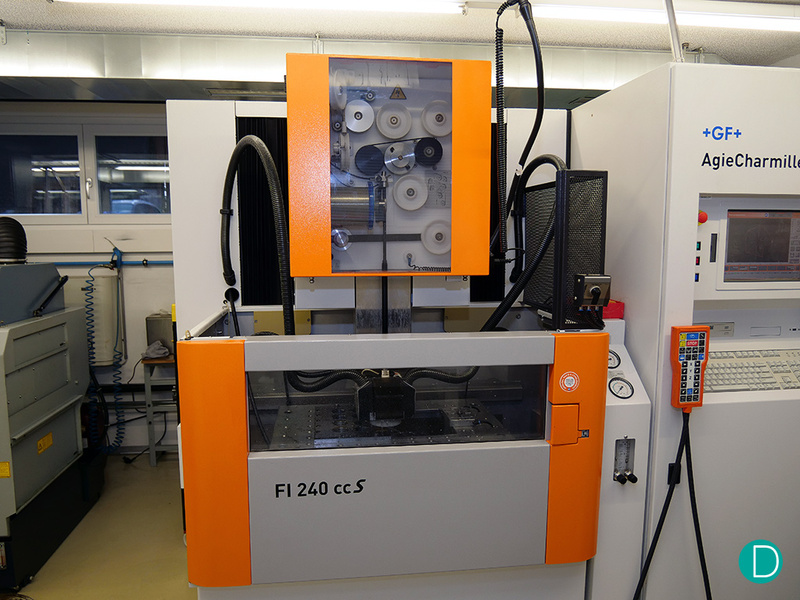 We then move to the manufacturing side, most of the components are produced modern machines. These are programmed and controlled by an experienced engineer. The operations order and the optimisation of the machines’ work is done by the Head of Fabrication. 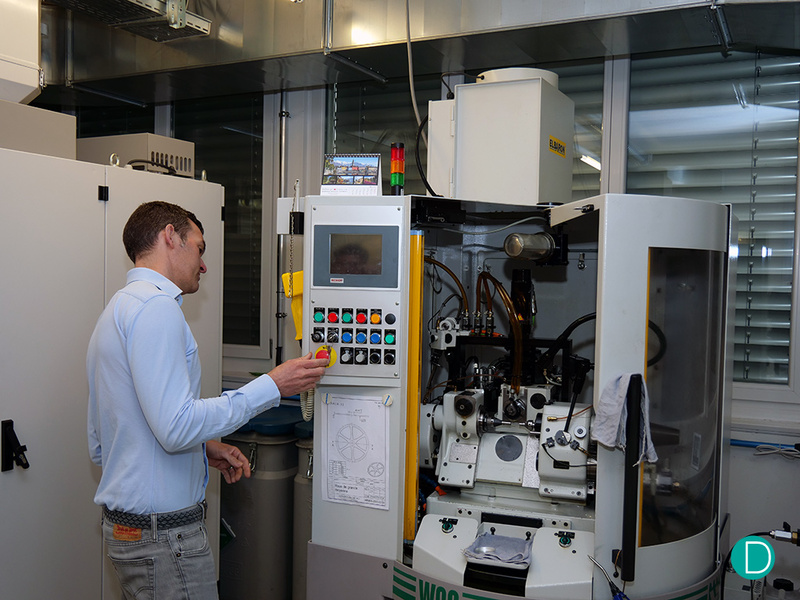 He is able to control precisely every step of each of the machines installed in the manufacturing hall. After a component is designed, it comes the turn of Kevin to take care of the processes necessary to have the final product. 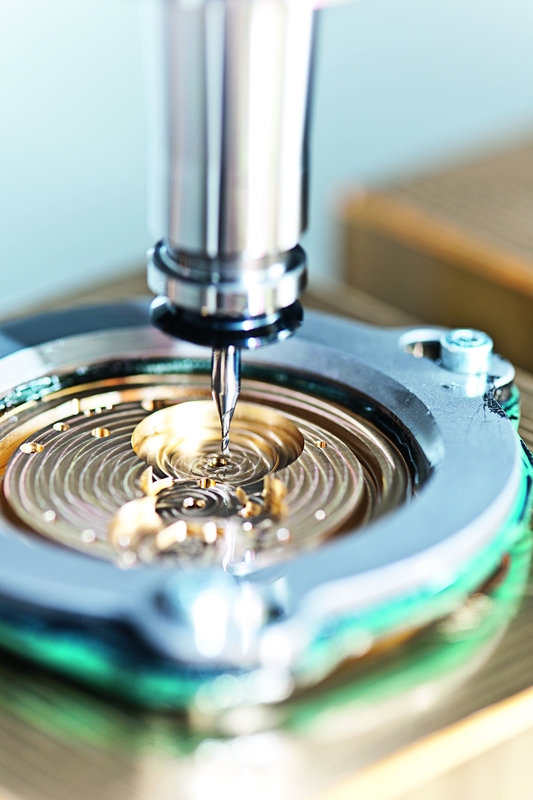 As a fully integrated manufacturer, Armin Strom starts with the raw materials. 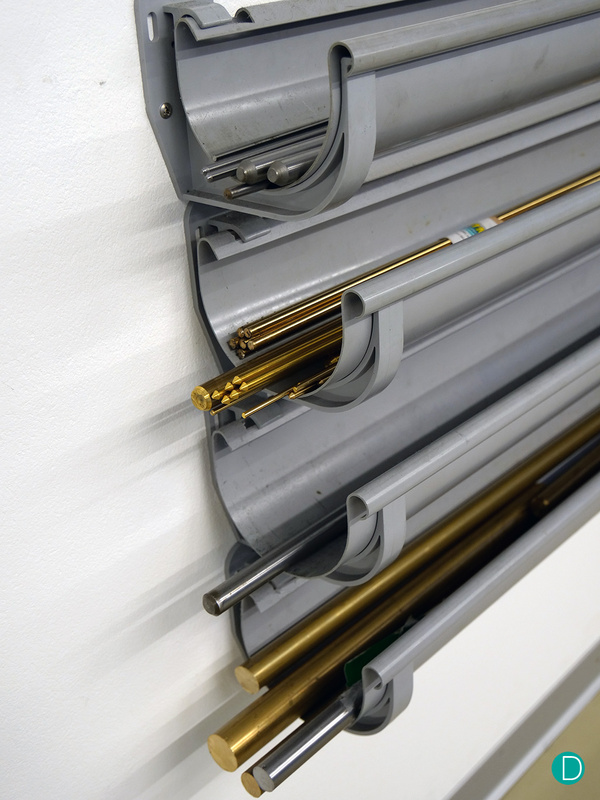 Below we see steel, titanium, brass rods which are the raw material used for the manufacture. Armin Strom buy raw materials like steel and brass and produce all the components for the movement. 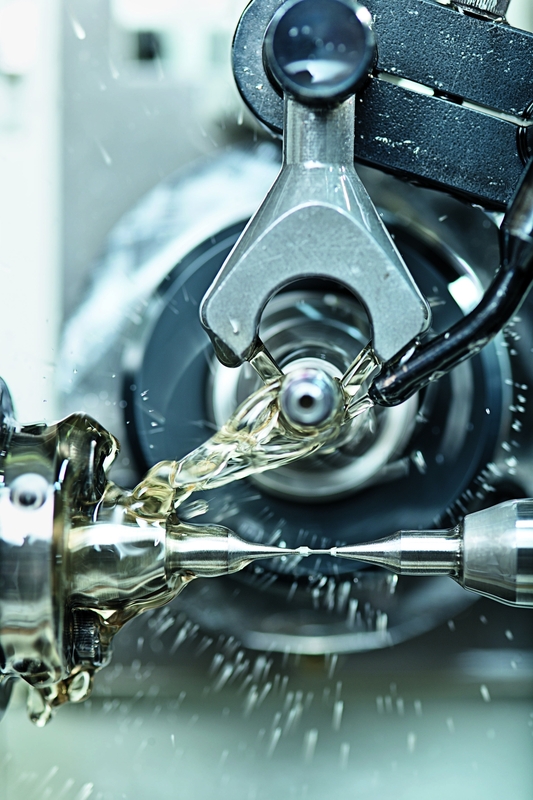 The manufactory owns two powerful milling/drilling machines capable of doing small parts. 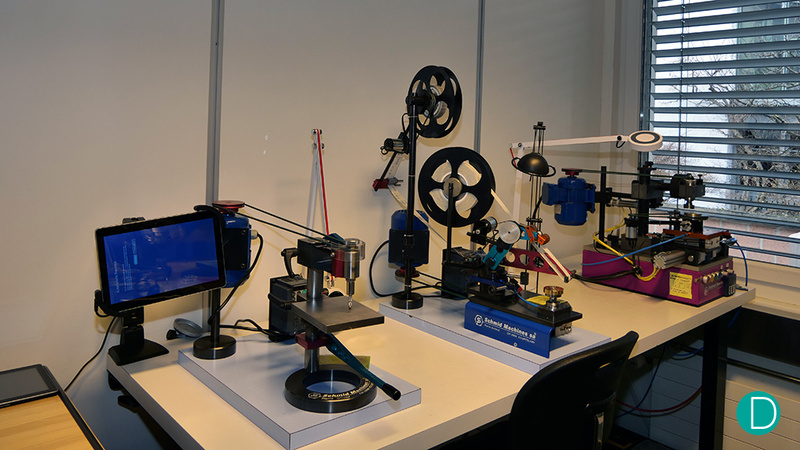 From small screws to balance wheels, the machines can be programmed to obtain complex shapes. One of the complex machines used to produce small components like screws. Programming the machines can take up to two or three days for a specific piece. That is why the machines produce a large number of components. Due to the modular design of Armin Strom watches, a small component like a screw is used in all designs with the same specification. 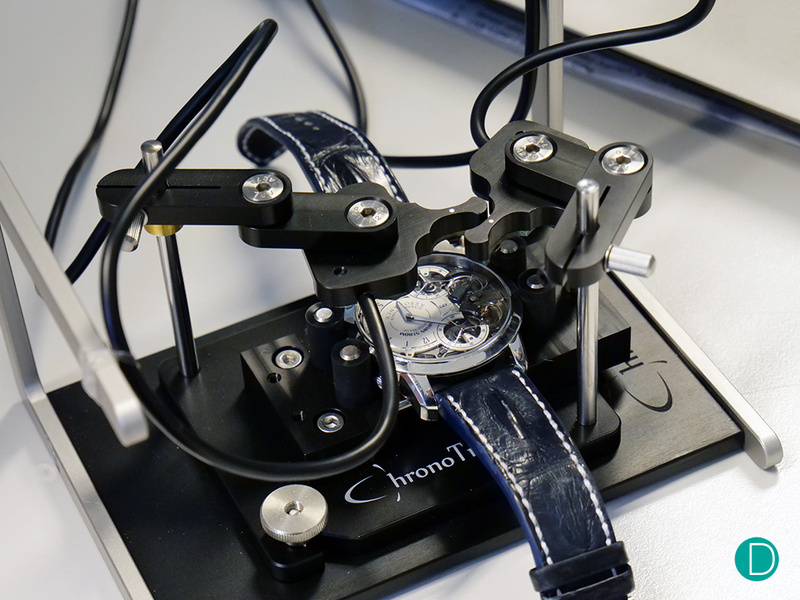 As they currently have spare capacity, Armin Strom also produce parts for other brands. 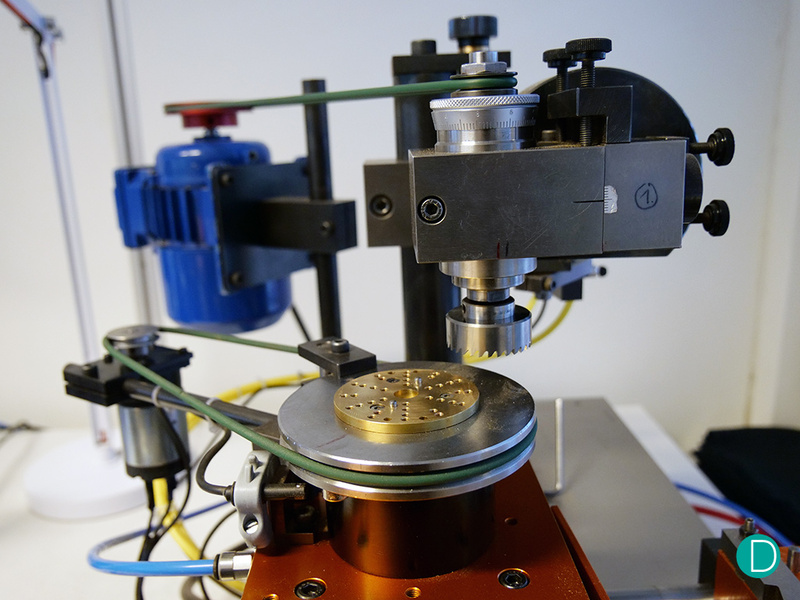 A complex component like the balance wheel can be produced by a single machine using several processes. 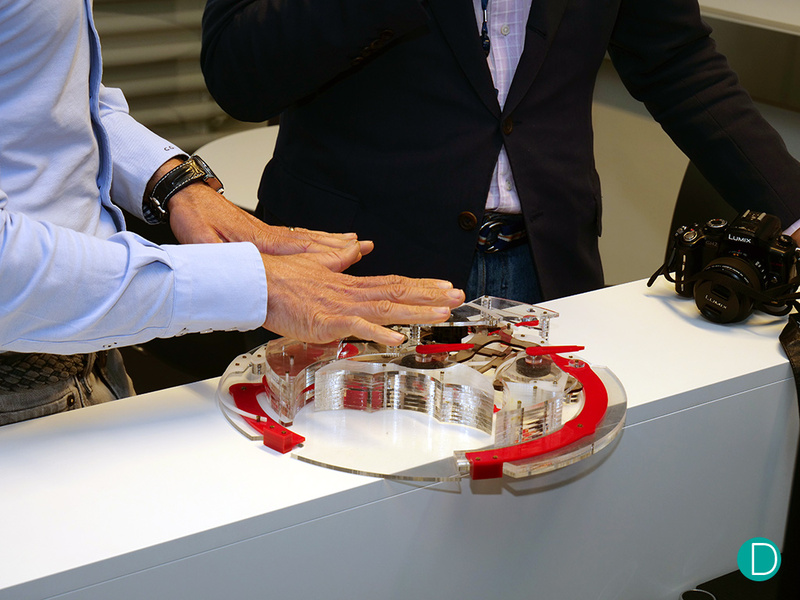 Another skill that Armin Strom is very proud of is the gear train cutting. A base plate is milled in one of the machines above and then the gears are cut by an experimented technician. The gear cutting machine requires a trained and experienced technician. The gear cutting machine has to be carefully operated to obtain the right shape and dimension of the teeth. The machines presented above work with round raw materials and produce round shaped components like screws, balance wheels and gear wheels. For other complex shapes are used other types of machines. Complex shapes for movement’s main plate or bridges are obtained using multidimensional milling. The plates are fixed on the CNC and milled to the desired shape. 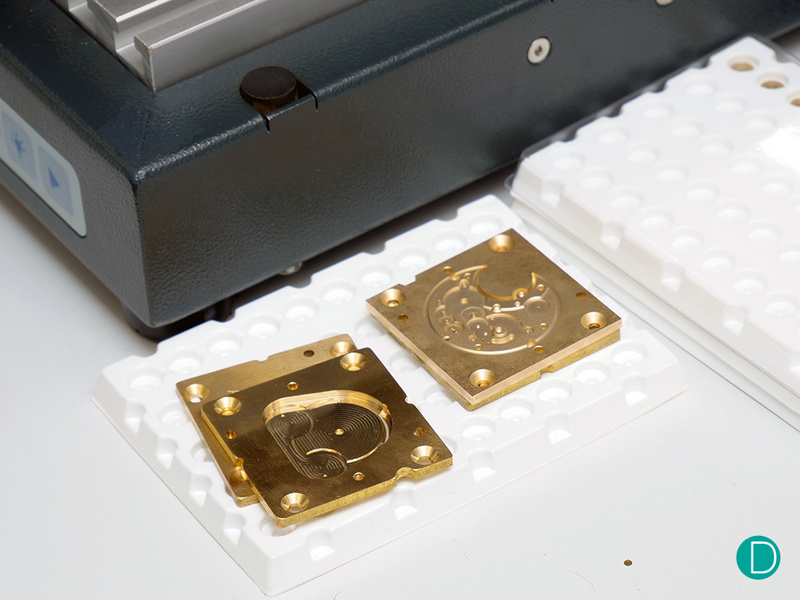 The CNC is able to produce the larger piece like the main plates but also smaller components like escapement bridges. The head speed can have up to 60.000 rotation per minute. All the main plates and bridges are produced in this manner and then decorated. The small components are not cut using the CNC milling. The process is not precise enough for certain components. or this a wire erosion machine is used. Cutting by wire erosion is a sawing technique using a thin wire made of steel alloy heated by electrical current. The heat of the wire and the sawing continuous move cuts through material. 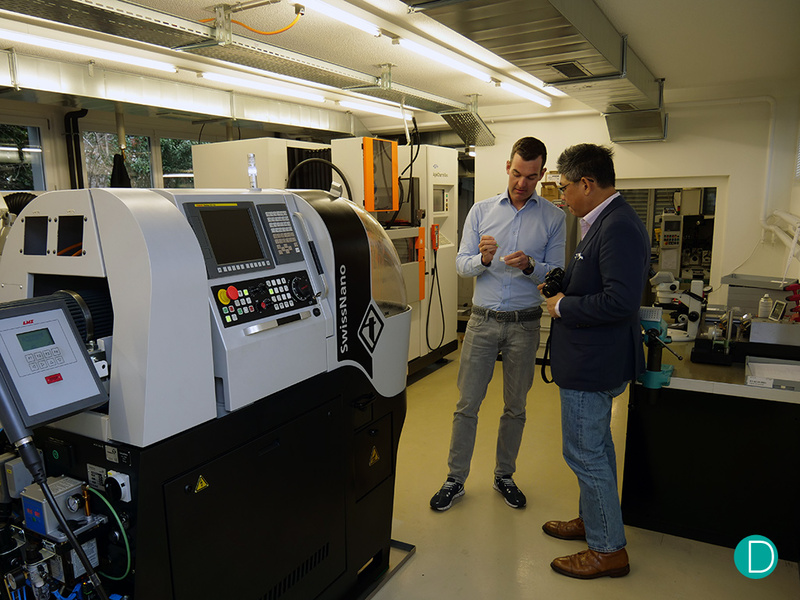 This tool is called inside the manufacture the “Armin Strom machine” for its capabilities and performance to do precise cuts, just like Mr Strom did. Wire erosion machine can produce a complicated shape with high precision. Before going to the decoration department, the components are rigorously checked. It is very important that all the components should be in the specification. With this control, faults and non-conforming parts are discovered before the final assembly. 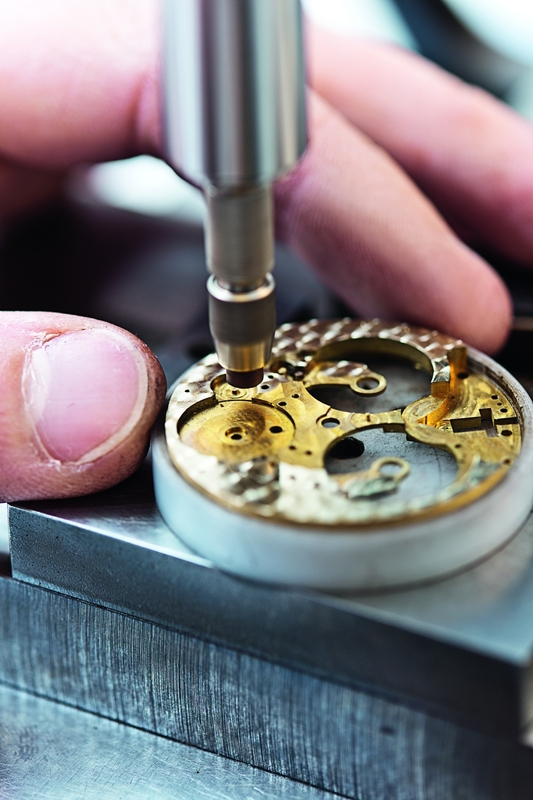 The decoration workshop is responsible for the classical finishes and engraving found on Armin Strom watches. 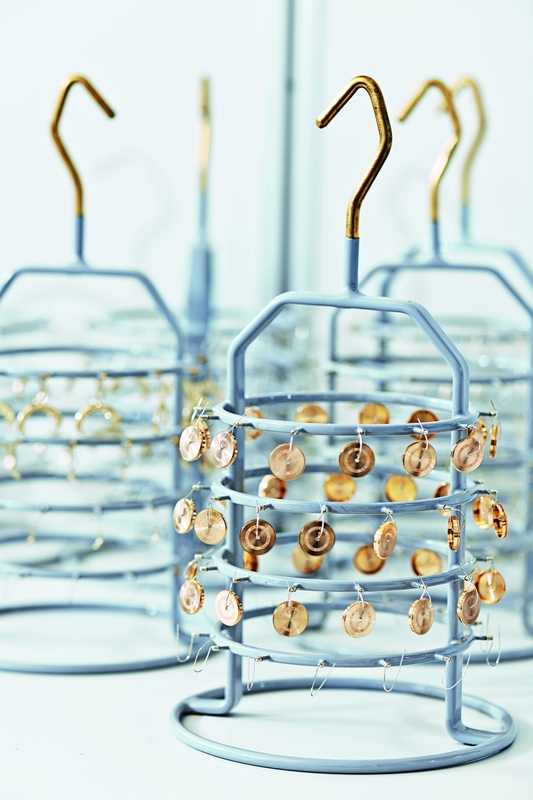 The movements are decorated with haute horlogerie levels. That means that even the invisible sides are decorated to the highest standards. The manufacture’s artisans are able to obtain a complete perlage even in the most difficult areas. We find this attention to detail interesting, as many manufactures often do not perform complete perlage to the edge of a countersink as this is very difficult to do properly. 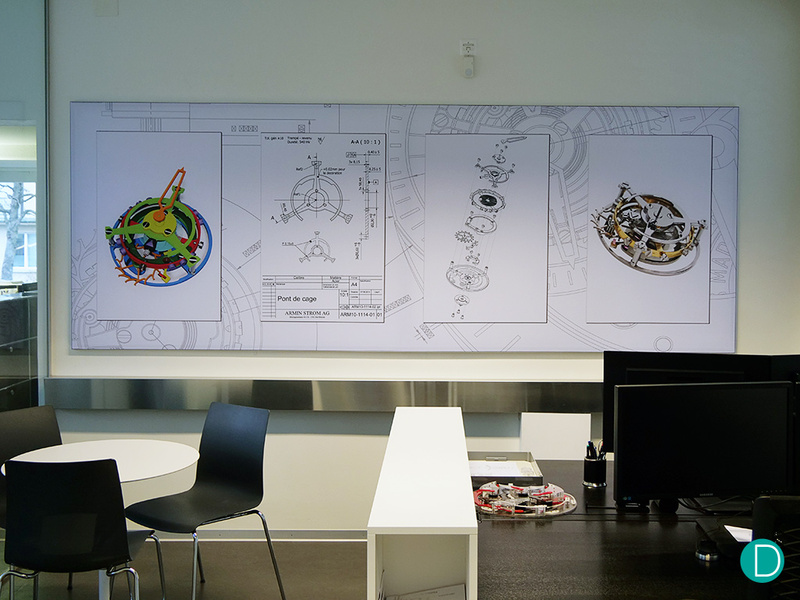 Armin Strom decoration workshop is capable to obtain one of the most complete perlage finish on the market. An example of the decoration of an Armin Strom watch’s mainplate. Please note the exemplary applied perlage, which can be seen to be performed right to the edge of the indented portion. Some of the movements are decorated with hand engravings. 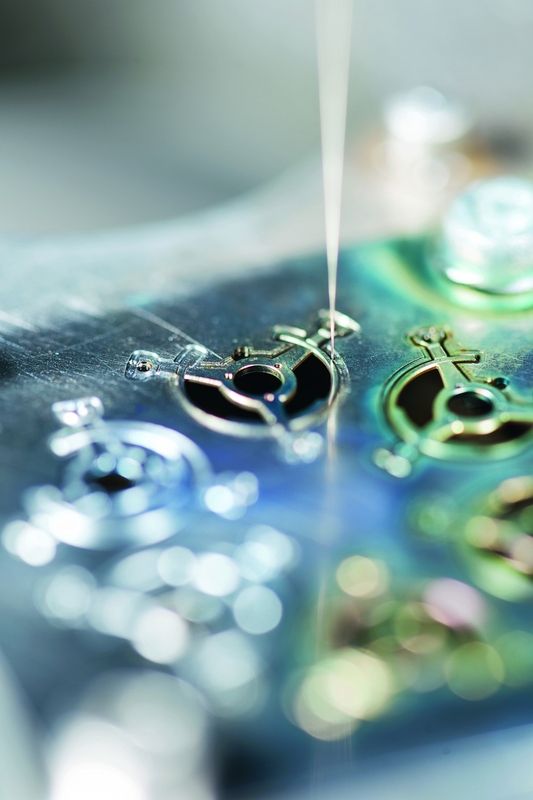 Armin Strom uses a laser engraving machine for technical or special engravings that cannot be made by hand. The “printer” is capable to imprint complex shapes into the metal. The laser engraving machine can engrave complex shapes or drawings. Example of a laser engraving on a mainplate. 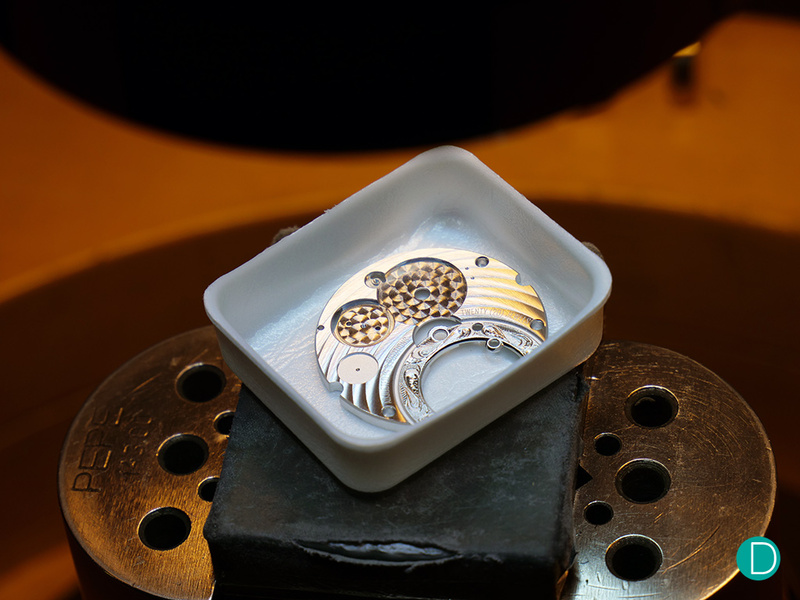 After the parts are decorated, they are sent to the plating department. The plating is important to prevent oxidation but also to bring a nicer finish look. Armin Strom capabilities include a large palette of colours available for collectors wishes. 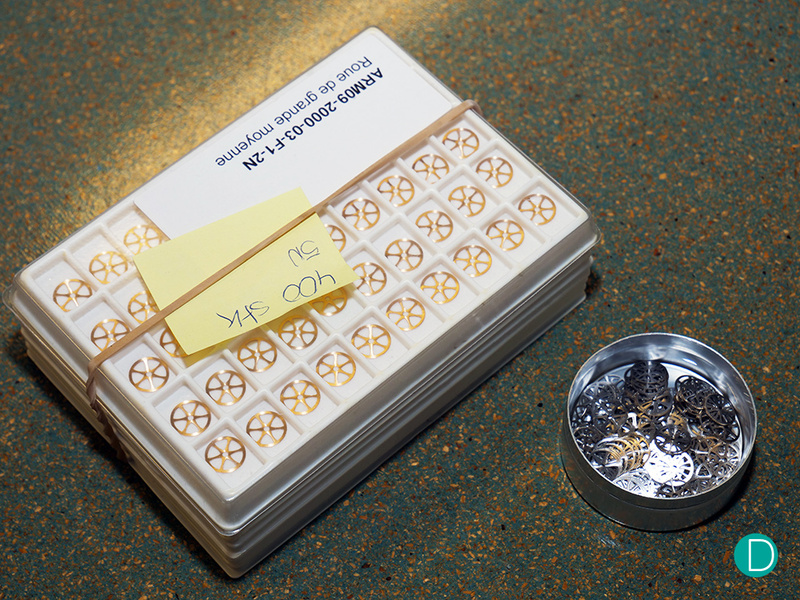 The parts are prepared for electroplating. First, the brass parts need to be cleaned by any residues or fat and then a pre-gold treatment to make the finishes and decoration more spectacular. The next step is a nickel plating to prevent brass oxidation. The final look can be obtained with ruthenium, rhodium, gold or other precious metals. 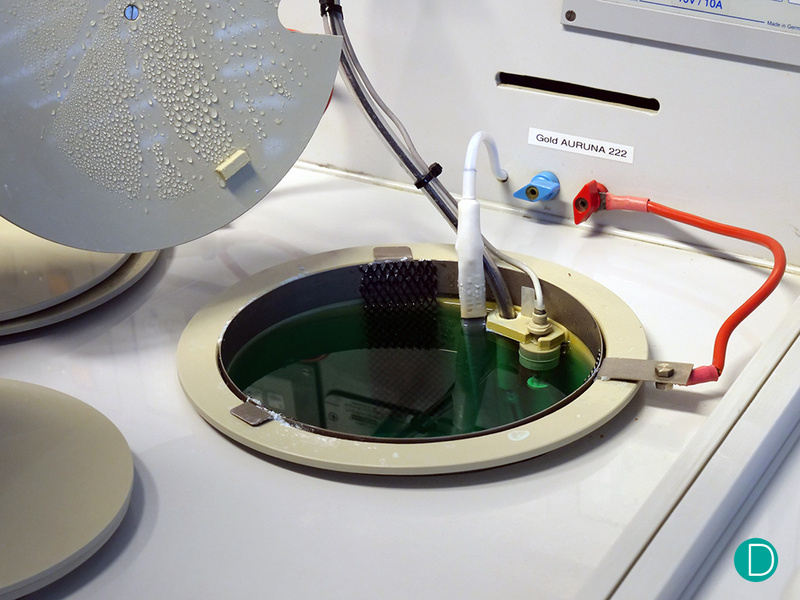 One of the electroplating baths waiting to give the best shine possible. 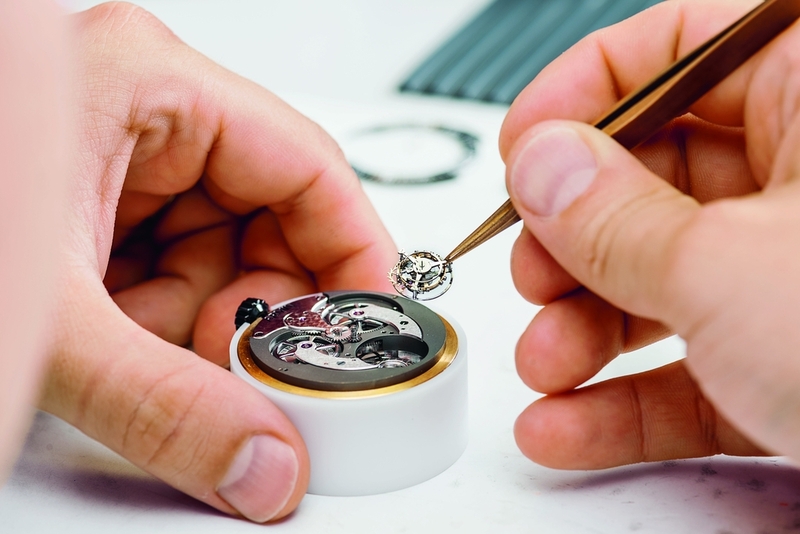 The watchmakers’ workshop is responsible for final assembly and testing. 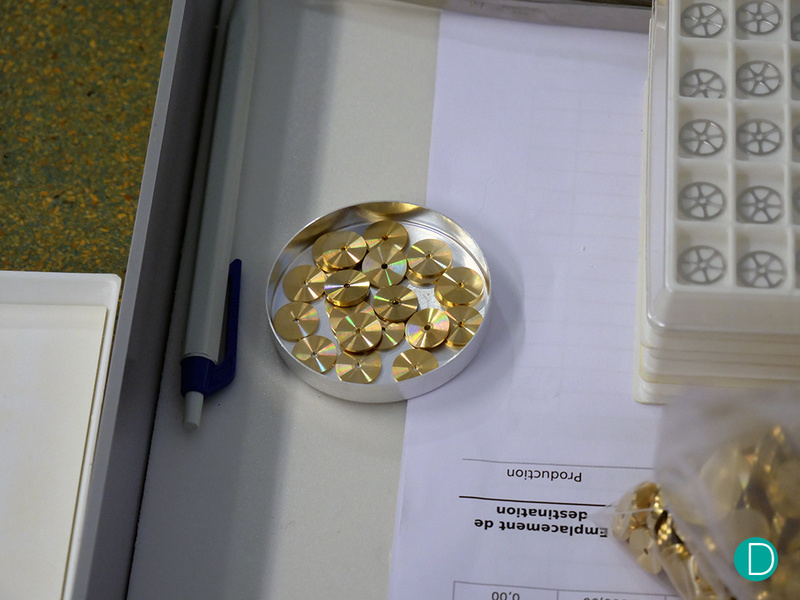 The preassembly of the jewels and other components is done in the same workshop. After the movement is completely mounted it is tested up to a month: adjust the movement, test for the correct functionality (depending on the movement type). After assembly, the movement is tested and regulated. Image courtesy of Armin Strom. The final assembly is then performed to put the entire watch together: the dial is mounted, the hands are attached and the watch is cased. After the final assembly, the watch is tested again for water tightness and correct functionality. The brand uses a special device to check the regulation of the Mirrored Resonance. 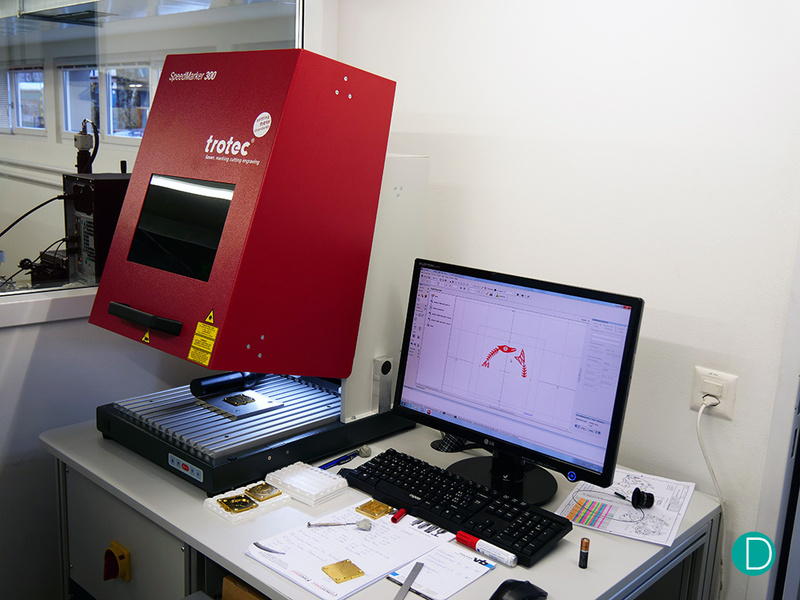 Using a computer controlled laser, the resonance can be tested accurately. 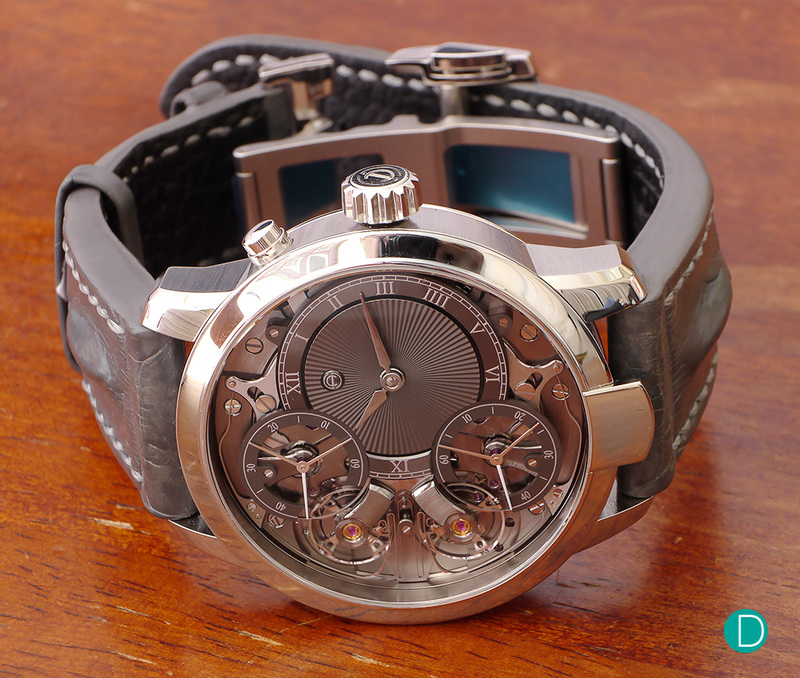 We always appreciated Armin Strom for their interesting calibres and nice watches. Visiting the manufacture was an eye-opener. The small independent brand is capable of a self-supplying at a very high level. Not many brands can brag with 98% in-house produced movement. Their modularity in design permits them to use components like screws to more than one calibre. The manufacturer is capable to supply other brands with parts due to their versatile equipment and high experience of their technicians and artisans. The brand designs every component of the watch. The case, for instance, is designed in-house and produced by a small, independent case-maker. And the best reasons for it is that for precious materials like gold it is required a special license. We appreciate the commitment and work they put to achieve this level.